Report released assessing current and future potential value of digital trade for Vietnam's economy. The economic value of digital trade-enabled benefits to Vietnam’s economy is estimated to be worth VND81 trillion ($3.5 billion) but this could grow 12-fold under the right settings by 2030, according to “The Data Revolution: How Vietnam can capture the digital trade opportunity at home and abroad” report released on March 26 by the Hinrich Foundation with the Central Institute for Economic Management (CIEM) and AlphaBeta. The report assesses the current and future potential value of digital trade for Vietnam’s economy. The value of digital trade is estimated to reach VND953 trillion ($42 billion) by 2030, which is equivalent to 9 per cent of Vietnam’s projected GDP, according to the report. 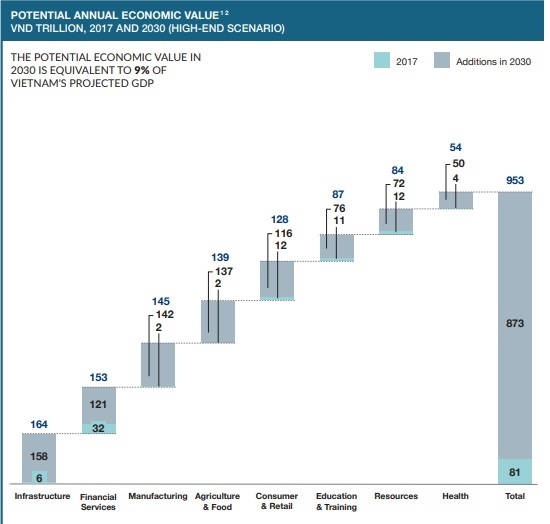 Potential benefits are spread across all sectors of Vietnam’s economy but are particularly relevant in infrastructure, financial services, manufacturing, and agriculture and food. The research employed a broad definition of “digital trade” that covers the production, distribution, marketing, and sale or delivery of goods and services - domestically and abroad - supported by cross-border data flows. Vietnam’s digital exports in 2017 were estimated to be worth over VND97 trillion ($4.3 billion). This makes it the country’s eighth-largest export sector, accounting for 2 per cent of its total export value. If digital trade is fully enabled, Vietnam’s digital exports could potentially increase by almost seven-fold to reach VND652 trillion ($28.7 billion) by 2030. According to the report, besides creating value from abroad through digital exports, digital trade also supports large productivity improvements in Vietnam’s domestic sectors. Yet, traditional economic measures fail to adequately measure the value of digital trade to exports and Vietnam’s economy. A robust fact base is therefore crucial to ensure that the value of digital trade is fully appreciated and taken into account when formulating trade and economic policy. This includes assessing (a) the current and future value of the digital trade opportunity for Vietnam’s exports and the domestic economy; (b) perceived concerns relating to digital trade abroad and how these could be addressed without unduly impeding digital trade flows; (c) priority areas Vietnam could focus on in order to fully harness the benefits while managing the potential risks of digital trade.